Excited about Pokémon Black and White? Of course you are, and what better way to boost that excitement than with a monster-themed giveaway at Gamestop? Trainers who visit participating stores will receive the legendary trio of Raikou, Entei and Suicune in their super-rare Shiny forms for their Pokémon HeartGold and SoulSilver games. 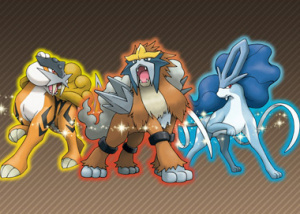 Transfer the glittering beasts over to Black and White and you can unlock Zoroark, a monster that can't be unlocked by normal means in the game. The promotion is running from today until February 6th, so you have a month to snap up those Pokémon ahead of the launch of Pokémon Black and White on March 6th. Details are below. Where: U.S. and Canadian GameStop stores. How: Players must have a Nintendo DS™ system and their own copy of the English language versions of Pokémon Diamond, Pearl, Platinum, HeartGold or SoulSilver Version video games (each sold separately). Players must have acquired the Pokédex within their game. Players must have no more than two Wonder Cards in their possession. Visit any U.S. or Canadian GameStop during the designated distribution period. More information on how to encounter Zorua in Pokémon Black Version and Pokémon White Version will be coming soon. I'll be getting each of the shiny beasts. I'm not gonna be left out of a shiny distribution as well as a special Pokemon distribution. That would be quite sad to miss this and start Pokemon Black on the wrong foot. When they're confirmed we'll have them. Hey guys do they usually do these kinda events in Australia? No fair! Why cant they make a WiFi event? What possible advantage do they get if people come to their store?!?! Anytime a business gets customers to come to their store, they benefit. Ranting about a business trying to get more customers is stupid. @ noblo601: Stores such as Kmart, EB Games and JB Hi-Fi have hosted/sponsored Manaphy, Darkrai, Shaymin and Arceus events in the past. Other events have also been available via Wi-Fi. It's almost a certainty that we'll get access to the shiny beasts at some point, however, they are likely to be distributed closer to the Australian release date of Black & White. And what will happen with players (like me) who don´t live in US or Canada? Will Nintendo do this event via wi-fi? I hope Nintendo thinks about it because many of us want those Pokemon, as a matter of fact we need them because they´re the only way to get Zorua in Black and White. No WiFi event for these has been confirmed. However, just about every event this generation that has been done in stores has been followed up with a WiFi distribution for both PAL and NA regions. I'd watch serebii.net or bulbanews as these events draw to a close to see if any Wifi events are being announced. aw great!, I have to waste gas to get some shiny Pokemanz. Got Raikou yesterday. Don't forget that Ash's Pikachu at Toys R Us and Celebi at GameStop are comming too. Pikachu on January 30th and Celebi on the 27th. All these great Pokemon events all at once! Shiny beasts, Ash's Pikachu, and Celebi? Joy! can someone please explain to me exactly what a wonder card is because that is really confusing me i got the last pokemon via a wifi event and u were told to have a wonder card or something i had no idea but went and tried anyways and got the pokemon? SOB Now I want to punt a baby write an angry letter to my congressman. We dont have a Gamestop here. Just found out only DS Lite, DSi, and DSi XL work. My old POS DS from '04 was a no-go. Gonna have to borrow someone else's to get the Pokeymans. I went to the local GameStop here today and they told me I'd have to preorder the new game. I checked the wifi and they didn't have it on. I phoned another location and asked them about it though and they said there was no purchase or preordering necessary. I'll be going there later today. I have read other comments online where people have been told they need to preorder but the wifi has been on so they didn't have many problems. The local one here though is pretty small so I'm guessing they don't think they need to have it on. Thankfully I have things to do tonight in the area that the other one is located at as it is a forty minute drive from where I am. USA and Canada like always. That´s so lame. One down two to go~!! !